The Cambridge Companion to Greek and Roman Philosophy is a wide-ranging 2003 introduction to the study of philosophy in the ancient world. A team of leading specialists surveys the developments of the period and evaluates a comprehensive series of major thinkers, ranging from Pythagoras to Epicurus. 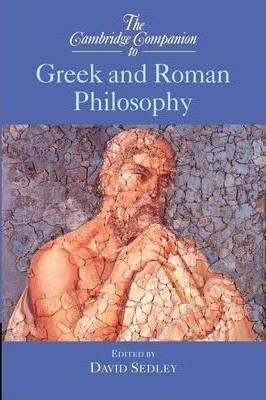 There are also separate chapters on how philosophy in the ancient world interacted with religion, literature and science, and a final chapter traces the seminal influence of Greek and Roman philosophy down to the seventeenth century. Practical elements such as tables, illustrations, a glossary, and extensive advice on further reading make it an ideal book to accompany survey courses on the history of ancient philosophy. It will be an invaluable guide for all who are interested in the philosophical thought of this rich and formative period. Introduction David Sedley; 1. Argument in ancient philosophy Jonathan Barnes; 2. The Presocratics Malcolm Schofield; 3. The Sophists and Socrates Sarah Broadie; 4. Plato Christopher Rowe; 5. Aristotle John M. Cooper; 6. Hellenistic philosophy Jacques Brunschwig and David Sedley; 7. Roman philosophy A. A. Long; 8. Philosophy and literature Martha C. Nussbaum; 9. Late ancient philosophy Frans de Haas; 10. Philosophy and science R. J. Hankinson; 11. Philosophy and religion Glenn Most; 12. The legacy of ancient philosophy Jill Kraye. David Sedley is Laurence Professor of Ancient Philosophy, Faculty of Classics, University of Cambridge. He is author of Hellenistic Philosophers, with A. A. Long (Cambridge, 1997) and Lucretius and the Transformation of Greek Wisdom (Cambridge, 1998).